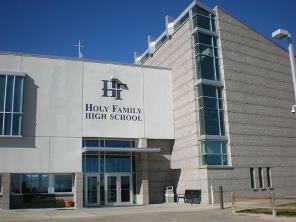 Holy Family High School is a Catholic secondary school for young men and women operated under the auspices of the Archdiocese of Denver. Holy Family High school is a community of parents, faculty and staff, administrators, students, alumni, friends and benefactors, all striving together to accomplish their common purpose; to build a community dedicated to excellence in education of the whole person and to service through our faith. Holy Family High School emphasizes the development of the whole person. We challenge each community member in the areas of religious education and of living out the Gospel message of Jesus Christ. Through Campus Ministry there are many opportunities for students to become involved in ministry including participation in the Campus Ministry Leadership Team, the Liturgy Music Club and the Mission Club. Students may also serve as Eucharistic Ministers, lectors, and liturgy planners. All students are required to take eight semesters of theology. Students are to fulfill the graduation requirement of community service through the Apostolic Ministry program. Students are invited to volunteer and extend their talents outward through service opportunities within their families, environment, school community, parish, and the Denver metro area. Each grade level has a special area of ministry. School-wide liturgies, prayer services, and the sacraments of reconciliation planned by our Campus Minister, students and faculty, enable community members to participate actively in the ministry of celebration. The Campus Ministry team, along with the student leadership, conducts the retreat programs for all levels of the school community. Your gift matters. Your gift counts. From our earliest roots with Fr. Cornelius O’Farrell who initiated the building of the first Holy Family High School, and the Sisters of Loretto who served our community for so many years, this institution has known success and growth only through the combined sacrifices of the many hardworking people, united by their belief in the value of Catholic education. Your heartfelt support is necessary for us to continue to fulfill our mission and properly serve today’s student body.